The doctors and staff at Stokewood Surgery and Old Anchor branch surgery, are proud to offer the highest standard of patient-centred healthcare.We offer a wide variety of clinics covering acute medical problems, the management of chronic diseases such as asthma and diabetes, antenatal and postnatal care, minor surgery, childhood vaccinations and NHS Healthchecks. 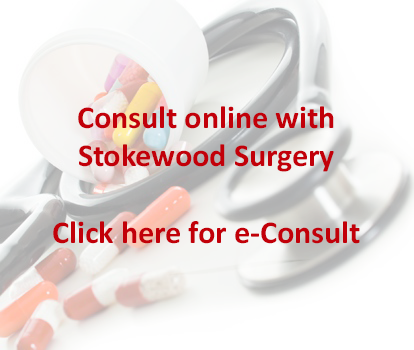 requests for renewing a Medical Certificate should be submitted via E-Consult. Old Anchor Surgery is our branch site located in Bishopstoke. All registered patients have the option to book routine appointments at this location. Text Messaging Service - Accurx. We are now using secure text messaging directly from our GPs and reception/admin staff for patients who have not opted out of text messages. If we have your mobile number, along with appointment reminders, we are now contacting patients firstly by text rather than phone if the GP wishes them to book an appointment following a test, collect a prescription or to let you know your referral paperwork is ready to collect. To get the best out of this service, please make sure you keep us updated with your mobile number. If you dont wish to be contacted, please ensure you have told our team to opt you out. registered patients. The Surgery is located at the back of the Badger Farm/ Sainsbury's car park. Appointments are available with a GP, nurse practitioner, practice nurse or healthcare assistant. The clinician will require permission to access your own GP records and will be able to organise blood tests, X-rays and referrals. A copy of the consultation will go back into your medical record. Make your views known and help us deliver the services you want... join our patient representation group - sign up online and take the short patient survey below. Thank you. All registered patients aged 16 and over are welcome to join.